Johannes Cabal, a necromancer of some little infamy, has come into possession of a vital clue that may lead him to his ultimate goal - a cure for death. The path is vague, however, and certainly treacherous as it takes him into strange territories that, quite literally, no one has ever seen before. The task is too dangerous to venture upon alone, so he must seek assistance, comrades for the coming travails. Assisted - ably and otherwise - by his vampiric brother Horst and by the kindly accompaniment of a criminologist and a devil, they will encounter ruins and diableries, mystery and murder, the depths of the lowest pit and a city of horrors. London, to be exact. Fans of Howard's witty prose and morbid humor will not be disappointed; his characteristic blend of horror, comedy, fantasy, and drama is particularly effective in this installment. Cabal remains an entertaining antihero whose complexities have deepened over time, and the conclusion of the narrative threads that have spanned the previous four Cabal books is both satisfying and touching. 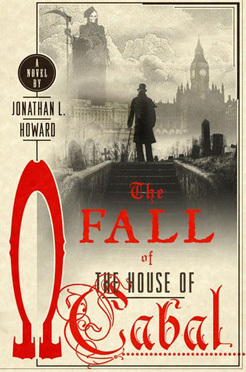 Howard is a supremely talented writer and the Johannes Cabal series makes for superb reading. It would be easy at this point to say if you like Rankin or Fforde or Pratchett or Holt, then you will love these books, but while it may well be true, it would be doing Howard a disservice. Jonathan L. Howard has such an effortless way with monsters and the undead that you might suspect him of being, like his creation, Johannes Cabal, a necromancer. The series is addictive. In the vein of the comic horror-fantasies of Tom Holt and Christopher Moore but substantially weirder.